Southern Africa has unique tourism expeditions. It is the region where the Khoisan – an indigenous population – inhabited the earth. Countries such as South Africa, Namibia and Botswana are home to the oldest communities in the world. Explore this list of guided tours which give you authentic knowledge of the indigenous people of Southern Africa. Within a three-hour drive from Cape Town, you will unearth the wonderful world of Cederberg. The expansive Kagga Kamma Nature Reserve is nestled in the majestic Southern Cederberg Mountains. Renowned for its otherworldly rock formations, visitors get to embrace the area’s rich cultural heritage. For eco-conscious tourism, visit Kagga Kamma, witness the ancient Rock Art sites, South Africa’s indigenous fauna and flora, and tremendously spellbinding night skies. 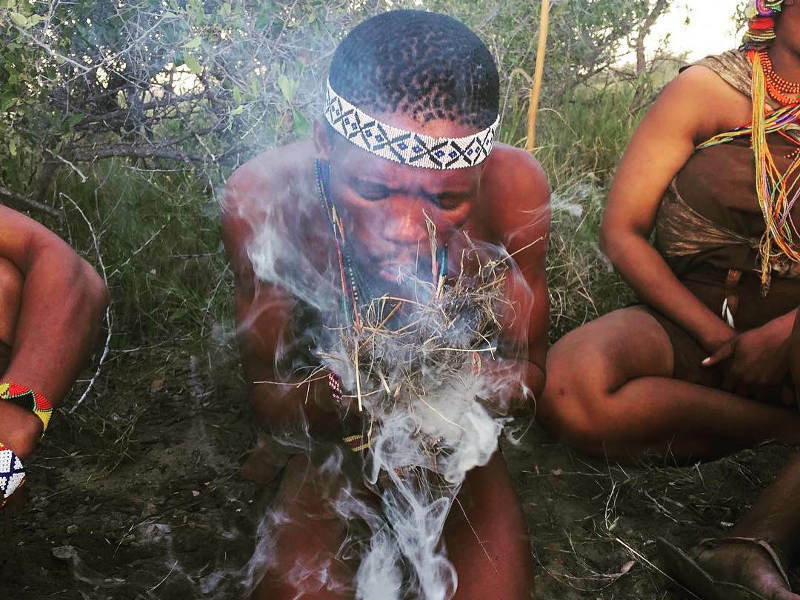 Learn about the unique customs of the San people. This group of indigenous people hunted and gathered in their environment, only taking enough from their surroundings to serve their needs. Take a guided rock art tour, and learn about the history and customs of the San people who lived in the mountainous Kagga Kamma area. The Kagga Kamma rock art displays deeply entrenched expressions of the San people such as spiritual, symbolic and religious markings. 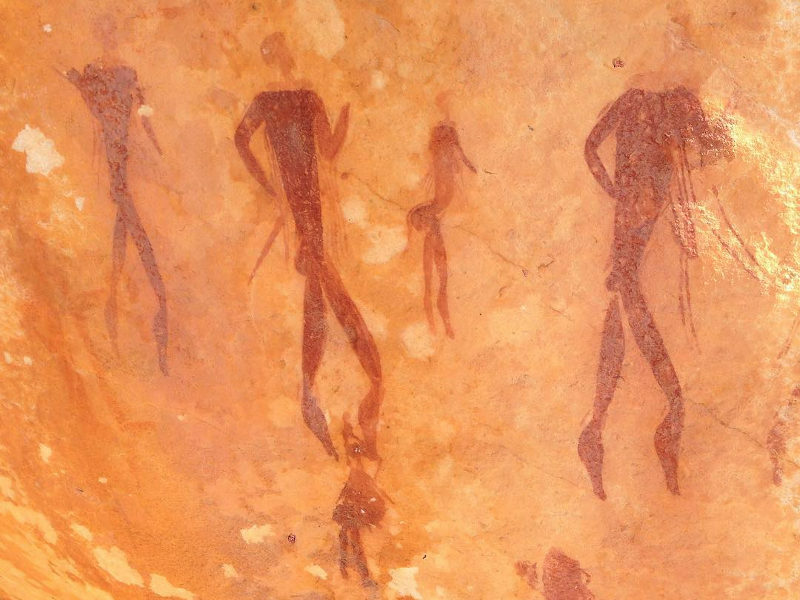 The rock art consists of eland, cattle and human figures. Kagga Kamma has unique accommodation which is ideal for nature enthusiasts. In Yzerfontein, you’ll find !Khwa ttu – a San Education and Culture Centre – a one hour drive from the city centre of Cape Town. It is the only San owned and operated cultural centre in the Western Cape. Partake in authentic interactions with the San people’s descendants. !Khwa ttu combines the love for adventure, relaxation and most importantly a strong sense of education enrichment. After you’ve been deepened with the knowledge on the San-guided tour, enjoy a hearty meal at the rustic farmhouse restaurant. The San guided tour gives visitors an insight into the present-day life of the San. Learn about the unique culture, heritage, knowledge and skills which were embraced by the San people as they navigated across the Southern African land. Witness first-hand the skills of traditional hunting, tracking and exceptional survival skills of the San people. You will also see the ancient everyday life demonstrated at the San village. Visitors will learn the clicks of the San languages, discover how the San people preserved and cooked their food, see how they were able to start a fire and make traditional San jewellery. You are able to do the tour either on foot or on a bicycle. !Khwa ttu has beautiful and cosy guest houses and tented camps. 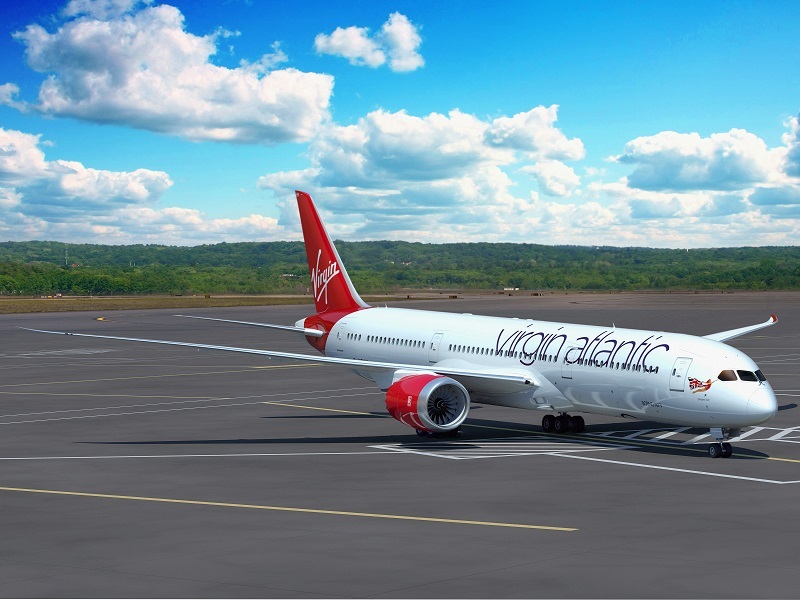 Visitors will enjoy the breeze of the West Coast countryside air. While visiting Tsumeb, consider including a trip to Tsumeb Cultural Village to your itinerary. The Tsumeb Cultural Village is located on the southern outskirts of Tsumeb. The community project is an open-air museum highlighting the native Namibian tribal communities’ history. Visitors can connect with the ancestors through the magical arts and crafts on display. The cultural village is a prominent feature at the Tsumeb Copper Festival – a four-day festival aimed at promoting business opportunities in the community. The Hei//Omn San people are the traditional inhabitants of Etosha and its surroundings. Participate in the insightful cultural activities along with the indigenous families and encounter the ethereal healing ceremonies. The guided tour will enlighten you about the indigenous people’s tremendous knowledge of natural medicine and foods. Get lost in the joyous singing and dancing. If your sole reason for trekking to Namibia is tracing your African ancestry, or to understand the way of life of the indigenous people in Southern Africa, consider the epic 3-day Eastern Kalahari Bushman & Batswana Tribes Camping Expedition. It is an in-depth safari which gives participants vast knowledge of the customs of the indigenous people. Participants will gain an understanding of the current issues they are facing in the Eastern Kalahari area. You will get to stay in a rural homestead; as well as eat, sleep and learn about the local way of life. This camping safari involves limited participation, which means tourists will have the chance to help set up their tent. The food preparation and other camp duties are taken care of by your tour guides, while you relax and soak in the Kalahari tranquillity. The tour departs every Friday from Windhoek and returns 3 days after your departure. The engaging tour will include a visit to the modern villages of both the Batswana communities and the San Bushmen. The tour guides will collect you from your Windhoek accommodation and transport you to the Okambara Lodge before 09:00 am. There, visitors will see some amazing game such as elephants, giraffes, and square-lipped rhino. 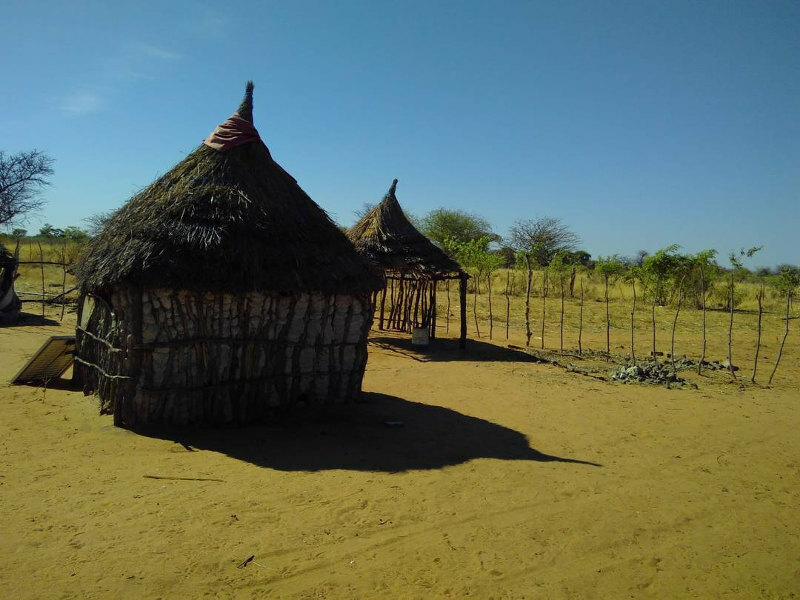 Journey to the San-Bushmen Village located in the eastern Kalahari. 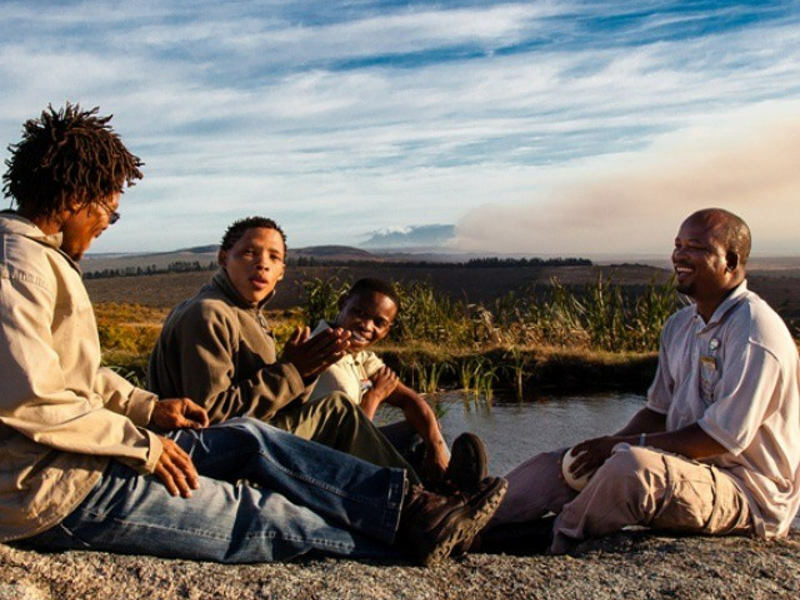 Partake in an afternoon bush walk with a clan of Bushmen. The indigenous people generously show tour participants their hunting skills such as stalking, tracking and sourcing underground water roots. You will learn how they gather food from their surroundings, which includes identifying edible plants. 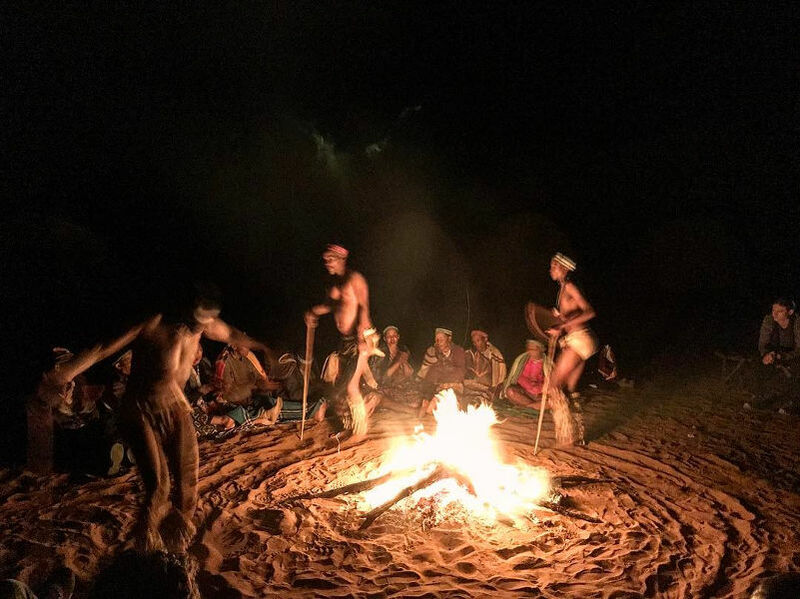 At sunset over the Kalahari, the Bushmen will share their gift of storytelling, and you will experience the transcending dancing and singing around the fire. See the full safari itinerary at Wild Dog Safaris. Surrounded by the serendipitous landscapes of the Makgadikgadi Pans National Park, Jack’s Camp is the ideal African getaway. Get lost while staring out at the midday mirage from the comfort of Jack’s Camp’s refreshingly cool pool. The real soul changing magic lies within the excursion spent with the San people. Walk with the native San trackers, join the women of the tribe as they gather herbs and medicinal plants, and experience the euphoria of the transcending trance dance. Visitors can explore the Kalahari alongside the Zu/’hoasi Tribe. You will be afforded the chance to visit the Bushmen Village where you will meet the elders of the community. Expose yourself to the expansive history of the first people of Africa. 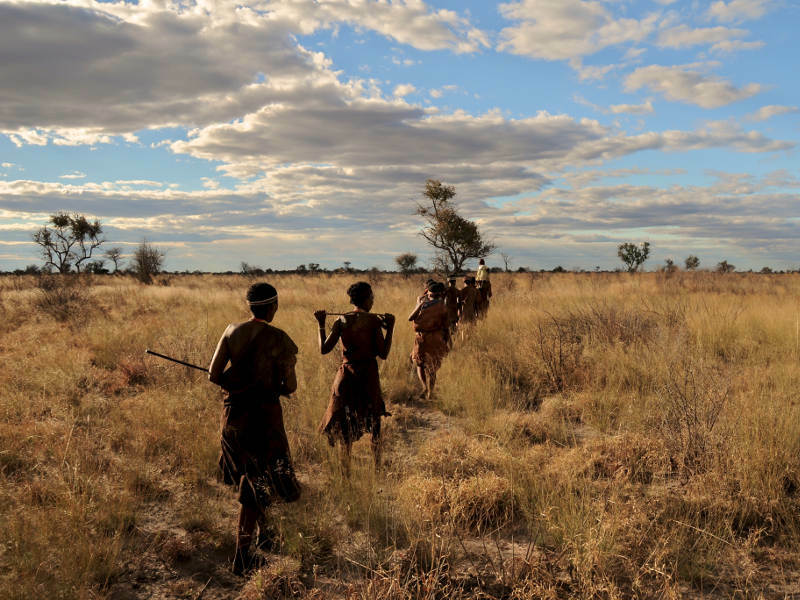 Walk through the indigenous settlement and witness first-hand how the Southern African indigenous people navigate across the Kalahari and experience the earth through their profound perspective. This tour affords you a powerful and humbling glimpse into the lives of the Zu/’hoasi Tribe. They proudly speak in their native tongue rich with clicks. Accompany them as they educate you about their rituals, using their environment for medicinal purposes. Watch the ethereal magic of the healing trance dance. Price Visit Unchartered Africa for pricing. Visitors can find one-of-a-kind accommodation in the Makgadikgadi Pans. Jack’s Camp is a favourite for many who visit the Kalahari.